CUT TO: Man tied to post in middle east with his back being whipped to the bone. ".... If a dictator provides free health care, I like that dictator. If a dictator provides a free university education, I like that dictator." CUT TO: Taliban woman being shot in the head in soccer stadium. Yeah, somehow I have a feeling that this movie is not coming to a theater anywhere near me this fall. But I'll be looking for it anyway. 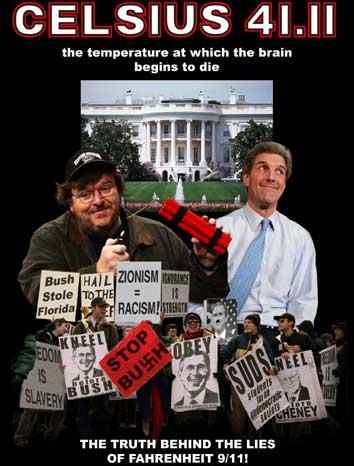 Funny how Moore's film was sanctioned by Cuba and Iran. Says something about Moore's views. Guess Havana and Tehran consider Moore to be a US patriot, abet a big, fat, greasy one.